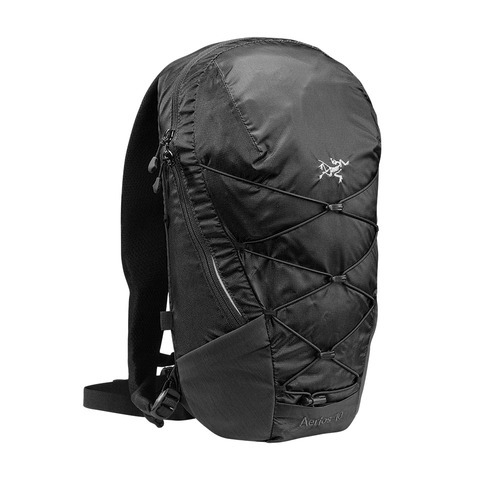 Perfect for trail running or light-and-fast day hikes this lightweight and trim fitting pack is designed to haul a hydration bladder food and compact outerwear. Featuring our AeroForm? backpanel for maximum airflow and comfort a modular bungee system for compression or cargo hauling expandability and a modular waist belt that can be positioned higher on the abdomen for superior bounce control.Driven by innovation ARC'TERYX was founded to build better gear. They didn?t just focus on incremental advancements but on radically improving the status quo. They began with climbing harnesses and then proceeded to tackle packs and apparel with the same single-minded obsession for creating the lightest best performing and highest quality products available. To realize their vision they?ve created groundbreaking new construction technology developed paradigm-shifting designs and harnessed major fabric technology developments. FEATURES of the Arcteryx Aerios 10 Backpack Internal zippered pocket is great for clippers - tape - headlamp Bioplastic top grab handle Ergonomically shaped shoulder straps for better carry comfort Adjustable position sternum strap Hydration bladder compatible via the Hydroport and Hydro Tube Clip Modular stowable bungee compression system Internal security pocket and key clip Mesh stow pocket Reflective blades for visibility in low light Adjustable position waistbelt Rides high on the back for minimal obstruction and better balance on the move Aeroform thermoformed back panel is hydrophobic and enhances air flow One extra bungee cord lacing hook Corded zipper-pulls reduce noise and are easy to grab 3D Moulded framesheet with anti-barelling ribs Highly breathable maintains comfort during aerobic activity 420D Invista HT Plain Weave 840D Stretch mesh Please note: Hydration bladder and hose are not included.